My friends (who all happen to be RIT alumni) finally got me out backpacking, for the first time in about 5 years, this past October. I took a long hiatus from carrying 40 plus pounds on my back, up and down mountains, due to a knee surgery I had a few years back. We decided to head to wild and wonderful, West by god Virginia, to a spot known as the Dolly Sods WIlderness Area. This place looks very similar to an arctic tundra, like parts of Alaska or Canada, and it is amazing to have such a unique landscape so close to home. I had been here before, and hiked a very short section of the trail we were hiking this time, but had never done any overnight trips. We drove up on a Thursday evening and had planned to camp out at the only car camping spots in the area - Red Creek Campground - which is right near the trailhead. We arrived at the top of the mountain around 1030 pm, and were surprised to find a lot of the roadside parking was full, and the campground with its 11 or so sites was also full. So we parked and left a note for Loren, who was meeting up us later that evening, that we had hiked in on a nearby trail and to meet us there. Thankfully we found a cell phone signal and were also able to text him our coordinates so he could find us in the darkness. Loren finally showed up around 1230, with some more cold beers, so we were obligated to stay up and drink it with him until about 2 am. We sat by the fire and caught up with each other while the fog rolled in heavily all around us. Our camp the following morning, the calm before the storm. The next morning we woke to a log of fog and slowly got our wet gear packed up for the journey ahead. Nate cooked us up some bacon egg and cheese muffins while the rest of us finished up packing. We headed out to the car and began to gear up for some serious hiking. Just about the time we were ready to go, it started raining - and raining hard - that big ol fat rain, like in Forest Gump. 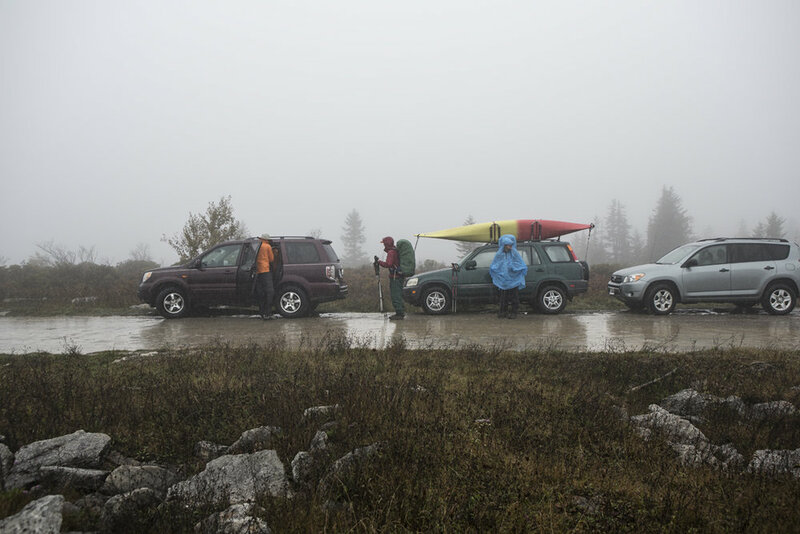 We jumped in the vehicles and put on all our rain gear, at least we didn't have to stop along the trail and fish it all out of our packs. The trail head was a few miles up the road, and we were there quickly, after a brief stop to see if we could get a weather forecast, but no luck. For now we just assumed rain all weekend, which was a pretty accurate assumption. The weather could only improve! Frank, Loren and Nate testing out the rain gear. Heading into the Dolly Sods, wet and wild. We started off at the trail head at Bear Rocks, and planned to hike about 8-10 miles each day, doing a loop and ending up back at our the vehicles on Sunday. Fall was definitely setting in here, and the colors were gorgeous, even when blanketed in a thick fog. Crossing Red Creek for the first time. The water was a bit higher on the way back. Frank and Loren doing some stream hiking. We did a lot of this. Some vibrant red and green on the forest floor. The rain that morning was on and off, but it was always foggy. When we go to the ridge, where normally you could see across the valley to the next mountain range, we couldn't see more than 100 feet in front of us. Up here the wind was relentless, but thankfully the rain was either non existent or a light drizzle most of the time. We found a few massive boulders to hide behind while we ate lunch, but mostly we were in a hurry to get off of this section. Hiking across Raven Ridge. The view could've been awesome. Instead we saw puddles and rocks. We finally got off the ridge, and decided to head down into a valley to a water source (left fork of Red Creek) and hoped to find a campsite there as well. When we got down to the creek - there were people everywhere, but thankfully they continued on their way after filtering water and we were able to find a nice spot beside some other hammockers in the pines. These neighbors helped us get a much needed fire going with the aid of a small hatchet and some vaseline soaked cotton balls. I won't ever rag on Frank again for wanting to bring a hatchet backpacking, it was a huge help. The rain held off until much later that evening and we had a relatively peaceful dinner around the warm fire. Nate and Loren prepping some dinner. The Dolly Sods is know for having been a testing ground for artillery during WWII. There are signs at every trailhead warning you to stay on the trail to avoid the possibility of finding a bomb or mortar that may not have exploded back in the day, and could potentially still go off. We didn't find any of those thankfully, but our neighbors learned an important lesson about warming up canned goods around a fire - put a vent hole in it first. This is something we all knew all ready, however the fellas from WV we were camping next to did not. I was off in the trees throwing the rope for our bear bag when I heard a loud explosion come from the campsite, no one was screaming so I assumed all was ok. When I got back to the campsite, I found our neighbors scooping chili off the ground with a trowel, and realized that the chili had exploded. So much for keeping the bears away from the campsite. Luckily no one was sprayed with molten chili, or shrapnel from the can, it could have been so much worse than someone's dinner being wasted. Frank's fire side chats. He told Nate and our campsite neighbors the story of wrecking a Honda S4 that belonged to another one of our RIT roomies. Our camp on night two, right before the rain set in for the night. Frank's set up was too far away to be seen. We decided that night if it was pouring in the morning when we got up, that we would sleep in. 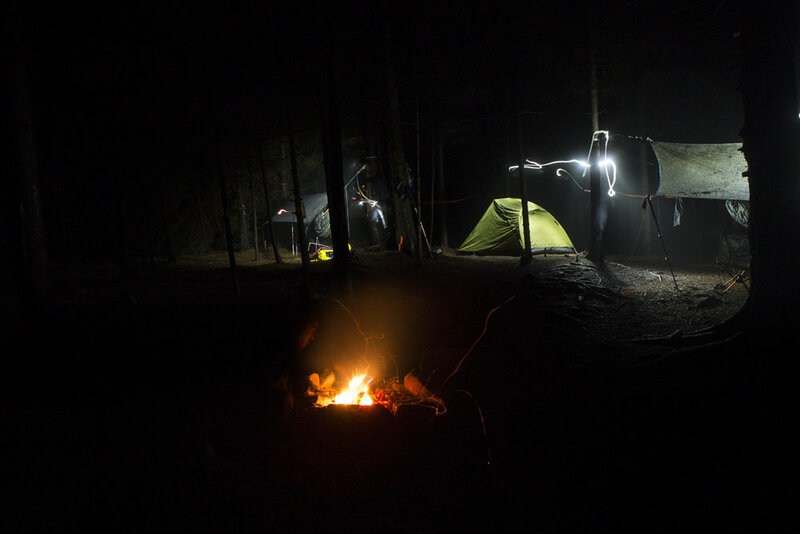 We all turned in as the fire died down, and fell asleep to the sound of rain pelting our tarps - we woke up to that same sound. I slept in as long as I could, but eventually I had to get up to take a leak. When I did, I decided this rain wasn't going to stop, and set to work getting the rest of the crew awake - by noisily beginning to pack my gear. After everyone was up and we had some breakfast under the protection of tarps we slowly began to take down our tarps, cover our packs and put our rain gear back on for a wet uphill hike. Crossing one of the many creeks on our second day of hiking. We started off the day with some entertainment, as we watched a group of about 15 cross the creek that we had camped near, and witnessed at least 3 of them step off the rock bridge and up to their knees in the water. They then turned around to watch us cross, hoping for more of the same, but were let down when we all made it across with dry feet. We headed up the hill and were soon hiking in a literal creek. I tried to take some shots, but the combination of body heat and moisture in the air were fogging up the lens too much, and since it was pouring rain still I didn't want to leave it out long enough to acclimate. We rock hopped with the aid of our trekking poles for about 1/2 a mile through this creek (trail) until we finally connected up to another trail that was a little less waterlogged. Loren in his creek crossing pose, probably the 3rd crossing of the day, unfortunately he was the first one of the day to get his boots wet in our group. This was the day of water crossings. We managed to avoid a few serious crossings by bushwhacking until we found our trail again, but some just were unavoidable. The rain let up for us by midmorning, and was on and off again all day long and we once again found lots of fog as we gained altitude. Grabbing a snack and changing socks after a wet creek crossing. Heading through the rhododendron bushes. A pretty large waterfall on Stone Coal Run. Once we passed the waterfall, we took a trail that was called Rocky Point Trail, and it turns out this was a very good name for it. Our pace slowed as we picked our way across large slick boulders, trying not to twist an ankle or knee. More fog from the view on Rocky Point Trail near Breathed Mountain. We attempted to find a spur trail that went to the top of Breathed Mountain, to a spot called Lion's Head. We missed the first turn off, so we decided to keep going and pick up the other side of the trail where it connected back up to Rocky Pt. Trail. When we found it, we wished we had turned around and chose the other route - because this one was pretty much straight up huge boulders. But we decided to climb it anyway, hoping to have a good view while we ate lunch. We made it to the top after a lot of nervous scrambling, and were disappointed to see more fog, so we quickly headed off the overlook to get away from the wind. We found a spot in the rhododendrons that was protected from the wind and we had a quick lunch, all the while considering if we should actually climb down what we had come up. We decided that it was worth the risk to climb down, rather than hike an extra mile and half to go back around the opposite way, so we slowly made our way back down the boulder field, and everyone got down safely. Frank at the bottom of the Lion's Head scramble. It was a bit too nerve-wracking to take any photos while we were on the boulders. We made it to a decent campsite, right beside Red Creek around 6pm. After some back and forth on whether or not we should stay here, a decision was finally made to stay. Frank and Nate had hiked ahead to a stream crossing just a 1/4 mile up the trail and found people everywhere - they came back with the news and we all decided this secluded spot would be our home for the night. RIT engineering at it's best - how to start a fire with toilet paper and wet wood. After about 2 hours of carefully tending a very poorly burning fire - which needed to be fanned constantly, with my trusty origami bowl - we finally had enough coals to let it burn on its own. It was quite the team effort, and it all paid off in the end. We were able to enjoy our mt house meals around a warm fire - the best way to raise your spirits after a hard day of wet hiking. A roaring, wet birch fire to warm us up and dry out some wet socks and boots. Our creek side paradise right next to the campsite. Loren almost tore his toe nail off while trying to get to the spot behind the boulder to paint it with light, it was looking pretty rough. We went the entire night with out any rain, and woke up to dry tarps and gear the next morning, it was quite a welcome feeling not needing to put on rain pants to start the day off. We had breakfast, packed up and were on the trail by 9, after a quick group shot with some blue skies. Frank doing some morning chores after a dry chilly night. The crew at our last campsite. We were quickly at the creek crossing where Nate and Frank had seen all the people the night before - and we were very happy we didn't stay here - there were about 8 sites, and it seemed like everyone of them was filled up the night before. We watched folks crossing the creek where the trail said to, wading up to their knees through the water, and decided to go off the trail to find a spot we could boulder hop - to keep our boots dry for the long hike ahead. Frank getting some use out of his new gaitors. Loren keeping his feet dry. Unfortunately all Nate's hard work to dry his boots and socks the night before was in vain. After crossing the creek, we again had a steep climb to get up onto the plateau that we would hike along for the rest of our trip. Thankfully we didn't have to hike up a creek today. Sunshine and blue skies, it felt so good! Nate and Loren avoiding the pond that had formed in the middle of the trail. Frank hiking right through that pond. Early fall colors on some windswept trees. Frank and Loren in the sunshine. Heading up the hill to our first truly enjoyable lunch spot. We completed the loop by hooking back up to the Bear Rocks trail. After a glorious lunch in the sunshine, we made it to the end of our loop, and began retracing our steps, on the bear rocks trail, back to the car. We passed about 20 times as many people on this leg of the trip than we had on our way out in the rain. Frank on the bear rocks trail - that "don't shoot me orange" really pops. When we got back to the trail head, it looked like a parking lot for Disney World, there were people everywhere. After about 7 or 8 sunny miles, discussing what we would be eating for dinner on our way home, we finally made it back to the trail head, along with the wind. As we stowed our gear in the trunks of the cars, being careful to not let anything blow away, I made an amazing discovery - we had saved two beers from our first night, and they were still cold! Victory was ours. We were on the road by 1:30, and on our way to a gluttonous meal of pizza and wings at a little spot in Cumberland MD. This hike wouldn't have been possible without gaitors and trekking poles, so I want to thank them for the support and dry feet. This was the most adverse weather I have had to endure on a hiking trip in recent memory, and it was good to find out I could still hack it. We plan on doing more overnight hiking trips next year, hopefully discovering some more awesome spots in PA and MD - places that may be a little closer to everyone, although WV never disappoints. To keep up with future adventures, scroll to the top of the page and enter your email in the subscribe box on the right.